Kefir? If you are not familiar with the term, you might be soon. At an increasing number of retail outlets one can find this cultured product that is smooth, creamy, and able to be flavored in numerous ways. Kefir “grains” are a mixture of yeasts and bacteria that are added to milk to ferment. The result is a smooth, creamy, and tangy smoothie-like drink. Kefir can be flavored with fruit, chocolate, etc. So why the interest in this new food trend? Well, actually, there is nothing new about it! Kefir has been a popular drink in Eastern Europe for centuries. Lately, it has garnered a lot of attention in the States due to the fact that Kefir is chock-full of probiotics: tiny bacteria that can assist in the functioning of your GI System. It doesn’t hurt too, that Kefir has a rich mouth feel and smoothness that makes getting your probiotics a treat popular with many, including kids. One can see a plethora of kefir products on the market reaching to numerous niche markets. 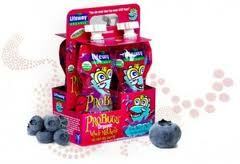 For instance, kids can get their hands on ProBugs(TM) from Lifeway Foods, an “Organic Whole Milk Kefir for kids with fun characters and flavors even the pickiest eaters will like.” Low-fat, non-fat, and whole milk kefir; frozen kefir; organic kefir; and even kefir cheese are other product choices that have shown up in retail outlets across the country. From relative obscurity a few years ago, kefir has come a long way in the U.S. market. 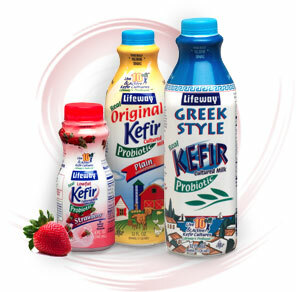 Lifeway, who controls 95-97 % of the American kefir market, has gone from a 12 million dollar a year company to a $80-100 million dollar company in approximately the last decade. The wide variety of products has provided an attractive and tasty way for consumers to garner more probiotics in the diet. To check out more about Kefir, including recipes and additional information on probiotics, check out the National Kefir Association’s webpage here. This entry was posted in Cheese & Dairy Products, General and tagged dairy, food trend, health, kefir, nutrition, probiotic. Bookmark the permalink. Follow any comments here with the RSS feed for this post. Both comments and trackbacks are currently closed.